Ann Grant, a photo by Nicole's Needlework on Flickr. I decided to get Ann Grant back out after finishing up Sarah E. Brooke. I'm really loving it! 40 ct. Summer Khaki (over-dyed with tan rit dye), AVAS and various hand-dyed silk threads (1 over 2). I sure do love those pink flowers. Can not wait to see Ann done. The colors are gorgeous! Look forward to your progress. I love the colors in this sampler. I need to get my Ann G. back out of the WIP pile. What pretty colours! Nice progress. She's a beauty, Nicole! Love, love, love those colors. CAn't wait to see more. Nicole, I also picked up Ann Grant last Friday. I started at the top. If we put our sampler together it is almost done!! Enjoy. I love working with the silks too. I can see why you enjoy working on her! She's looking lovely! Ann Grant is such a dreamy sampler. It looks wonderful. Wonderful progress! Ann is so pretty! Love it Nicole!! You're making me want to break out mine again. I really need to learn to start from the bottom - it's always more intresting!! Love Ann! She is kitted and ready to go. I am hoping to start her sometime this year. Beautiful colors! Love the fabric choice too. Another beauty to watch come to life! Lovely! I really love the pinks! I have been looking at this beautiful sampler too. Yours is really pretty! I am getting tempted for sure!! I really like how she is turning out. You picked some beautiful colors. Very pretty!!!! I love Ann Grant. What beautiful colours are in Ann. Looking forward to watching your progress. It's gorgeous, Nicole - I love the colors on this piece!! I would love it if you would visit my blog - I've started a new feature "a stitching party", and I'm encouraging people to link to their blogs and show off what they are working on! 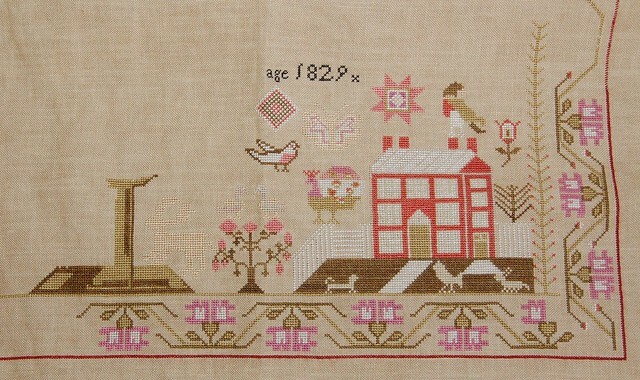 Very nice work on Ann, this is such a lovely sampler.